The Common Palmfly is one of three representatives of the genus Elymnias here in Singapore. The rarest one, Elymnias penanga (Pointed Palmfly) was last seen on Pulau Ubin in the early 90's and remains elusive to this day. The Common Palmfly is by far the most common of the three species and is found in urban Singapore, as well as in the forested areas. It has a good range of caterpillar host plants, usually species of Palmae, and many of the host plants are ornamental palms found in urban gardens. The butterfly very rarely opens its wings to show its more attractive uppersides. The shot here, taken by ButterflyCircle member Loke PF, features the Common Palmfly on the ripened fruit of the Singapore Rhododendron. 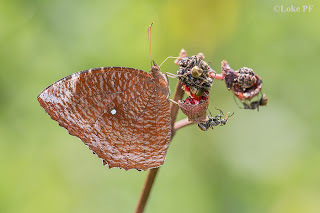 It is interesting that whilst food is available, even the ants leave the butterfly alone whilst they share the spoils together.